Greetings Dharma brothers and sisters. Welcome to our first official Universal Compassion Foundation (UCF) and Buddhist Institute of Universal Compassion Newsletter, and thank you for signing up. It is hard to believe that it has already been seven months since UCF purchased the facility for the Institute of Universal Compassion. It seems like just yesterday the renovation began and we were all cleaning and painting our new Temple Hall. Now we are open for Sunday Service in the morning at 10.AM, which includes teaching, discussion and yoga practice. We hope that you enjoy this newsletter as much as we enjoyed putting it together. 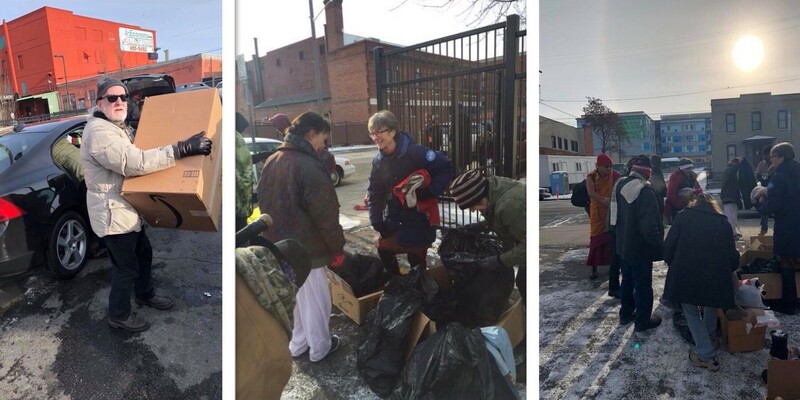 Our venerable Geshe-la Phelgye shoveling snow on the Institute front walkway. 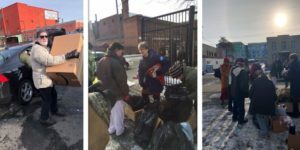 The Universal Compassion Foundation ended the year with a successful clothing drive for the Spokane homeless here in the freezing northwest winter; our Sangha members donated several boxes full of warm coats, boots, hats, gloves and winter clothing. UCF Sangha members distributed them on Christmas Eve to the local area homeless. Recently, Professor Geshe-la Phelgye was invited to PRIDE Prep Middle School to speak about Tibet and what it’s like being a Buddhist monk. The kids asked many excellent questions, mainly about Dharma. Answering the children’s questions was a great opportunity to share about love, compassion, humanistic values, and even about reincarnation. Geshe-la is teaching an Introduction to Buddhism for Beginners class. If you would like to attend, please visit our website at www.universalcompassion.org to fill out the online registration form. If you have any questions or issues with filling out the form, please see Yangzom for assistance. We look forward to seeing you there. Starting date and time will be announced soon. To find true and lasting happiness, we need to get to the root of problems and subdue them. Buddhism teaches us how. Geshe-la says no matter how long we are in Dharma, we may feel like we know a lot, but there is still so much left to learn and work on. We must continue to dig deeper using our best intelligence and put effort into subduing our negativity until we are able to uproot the causes of suffering. Obtaining Buddhahood may not be simple, but it is certainly achievable, as it was for Prince Siddhartha. Attaining enlightenment takes devotion, learning, living the learning, and persistence, maybe for many lifetimes, but eventually we will succeed, because when causes are earned fully, the result is obvious. Geshe-la urges us to study and meditate on the profundity of the teaching of interdependence. Everything that we do has consequences sooner or later; this is the law of karma. Also, faith and belief can be powerful but can be dangerous if your belief is irrational; ISIS believes in beheading people following their beliefs. Therefore, irrational faith alone can be dangerous. Geshe-la assigned senior Sangha members an essay to submit on “Why Buddha, Why Buddhism?” to see how many of these concepts we have learned so far. Geshe-la discussed the importance of proper behavior and etiquette when visiting a temple. First, it is always important to arrive early. In Buddhist culture, when you enter a temple, one offers three prostrations as gesture of respect and refuge in the three jewels. Next, enter the shrine and walk clockwise around the outside, paying homage to the Buddhas, Bodhisattvas and Deities at the altar by bowing your head. We are never to disrespect Buddha’s words or image by placing them on the ground or walking over or by putting another object over them. Should you see such an image or scriptures that has fallen on the floor, it’s important to pick them up, honor them by touching them to the crown of your head and put them up in a safe place. Will Buddha or the deities take care of your problems or do your job if you just pray to them? Is Buddha like the concept of God? Buddha never claimed any such thing. The purpose of Dharma is to transform yourself, first by taking the teachings inward, embracing them with your heart, and applying them in daily life. In fact, Buddha taught the nature of causality, interdependence as the truth of origination of all. Buddha addressed the reality of how we are responsible for our own actions and their results (karma) and Buddha pointed out our own potential to achieve ultimate happiness, which takes wisdom, compassion, faith and hard work. When situations are nice, practice is easy. The real challenge is when things are difficult. One of the main challenges we see today, even for those in the Buddhist path, is materialism. For some, Dharma is merely academic information, perhaps turning the Dharma into a profession to make a living, while others to seek the mundane to feel good or for comfort. Today Geshe-la read from our essays on “Why Buddha, Why Buddhism.” All religions teach us about love and compassion, which is why they all have millions of followers; however, as the object of love and compassion, Buddhism covers all sentient beings from human to animals, from beings in the water to tiny bugs in the ground and air. To really “get” Buddhism, it’s essential to have a teacher who cares about your learning and growth, not just one who smiles and praises you. The smiles and praise make you feel good, but these won’t take you to the quality of learning and transformation you are aiming to achieve; it is important to have someone point at our mistakes so we can correct them. Geshe-la said, “The essays from senior students on “Why Buddha/Why Buddhism?” are wonderful, describing overall qualities and legacies of the Buddha, thank you.” But among all those qualities, one thing that makes Buddha extraordinary compared with all others is the teaching of interdependence, dependent origination: relativity and the law of causality. Geshe-La and Yangzom have been busily working on renovating the current website; if you have a moment, please come visit the new features. We now offer the ability to sign up for our newsletter, register for future courses, even donate through PayPal as well. You may even catch a glimpse of yourself in one of the slideshows. We will try to continue this newsletter beginning quarterly, then progress to monthly and then weekly.